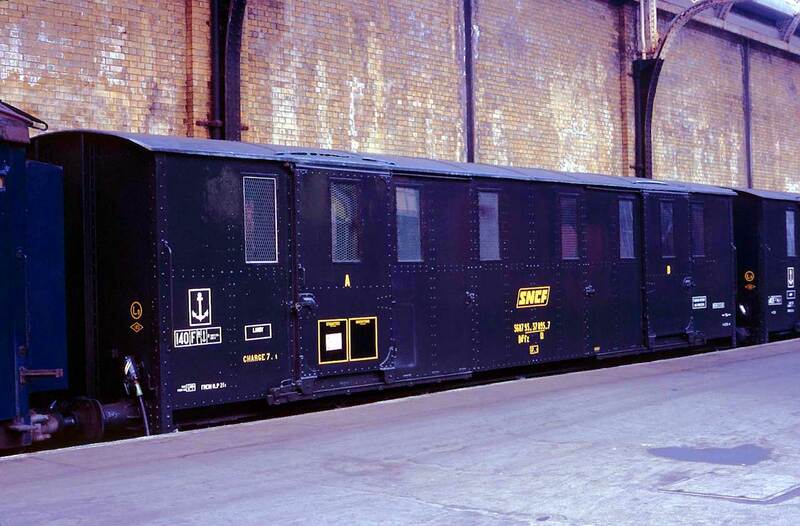 The Night Ferry was Britain's first international passenger train. 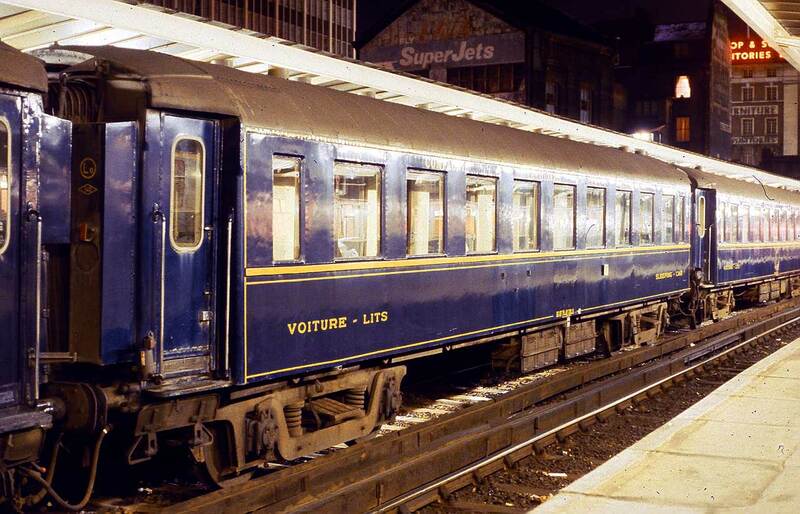 Service commenced on the evening of the 14th of October 1936 and offered overnight sleeping car service between London and Paris and eventually from 1956, to Brussels. The service was of course suspended during the period of hostilities. The Night Ferry ceased operation on the 31st of October 1980. 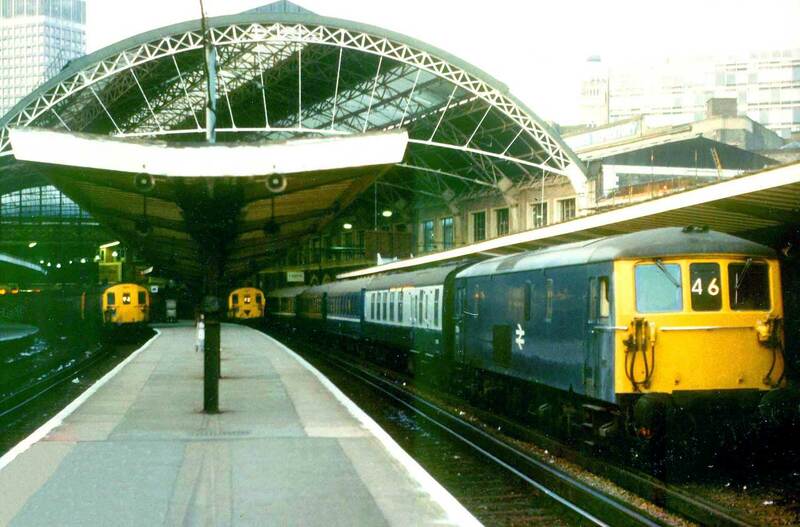 In the latter part of the 1970's, the train was hauled between London Victoria and Dover Western Docks, originally named Dover Marine, by either a Class 33 diesel electric or Class 73 electro diesel locomotive. Southbound, the first vehicle was a Mk. 1 Brake Composite Corridor (BCK S21270 or S21273), a minimum of two CIWL Type F sleeping cars and one or two SNCF vans. 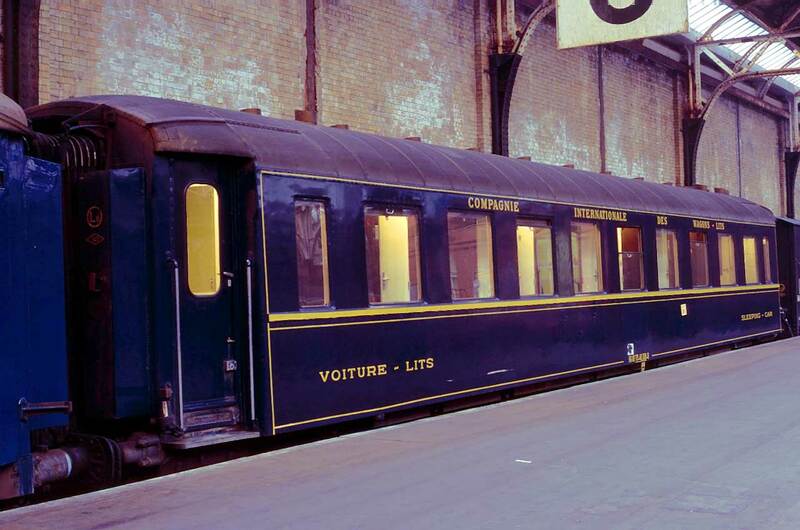 The Mk.1 coach was included in the consist only for the conveyance of the guard as the Night Ferry was exclusively for customers having a reserved sleeping car berth. The Mk. 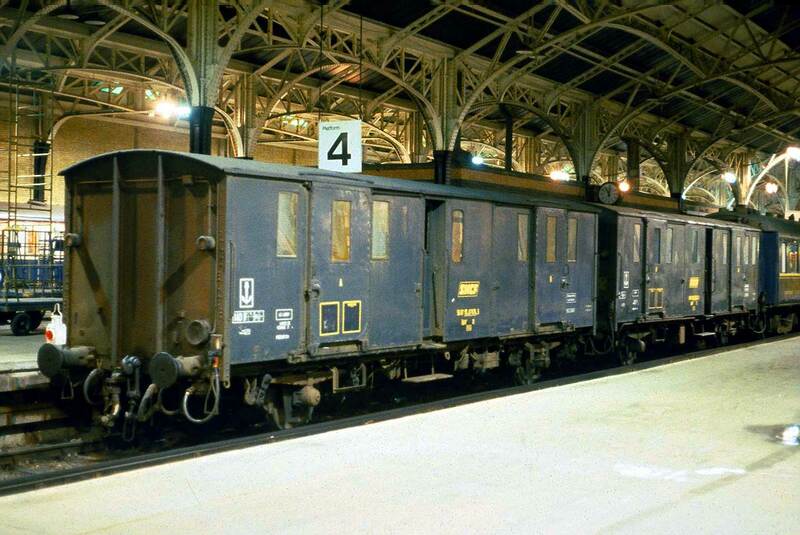 I coach had its gangways modified to align with the sleeping cars. 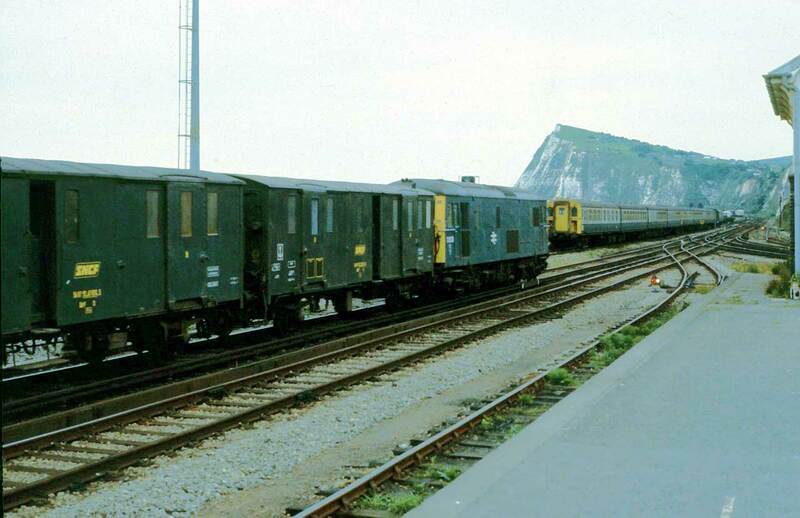 At Dover Western Docks the locomotive and BCK were detached and a Class 09 shunter would propel the sleeping cars and vans on to the ship for the crossing of the English Channel to Dunkerque. 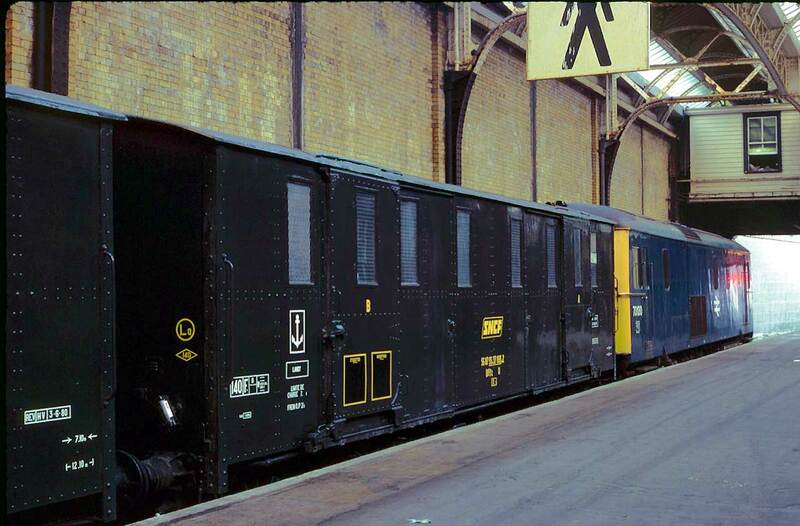 The reverse of this operation took place the following morning with the return working to London Victoria. By its nature, operating at night and on an extremely erratic schedule due to numerous disputes, the Night Ferry was quite difficult to see, never mind capture on film. 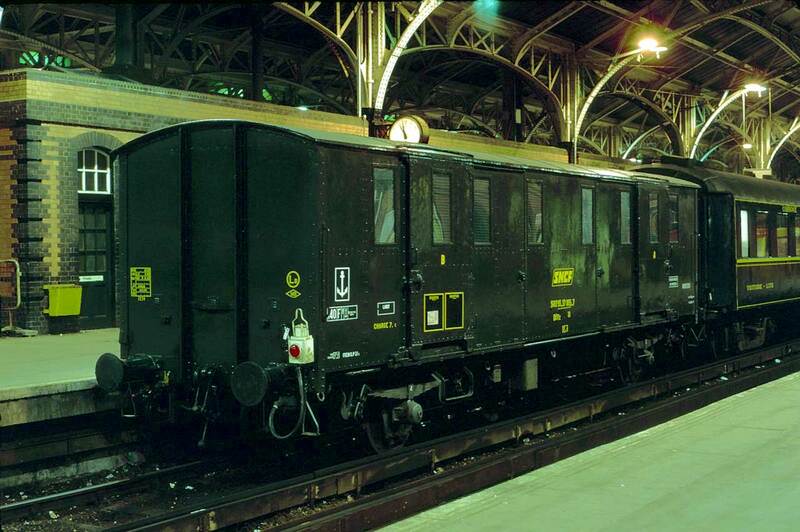 Despite all this, these photos were taken at London Victoria in the evening and Dover Western Docks in the very late evening and the extremely early morning during the final years of operation of the Night Ferry, between 1977 and 1980. Click on photos for a larger image. Use BACK button to return. 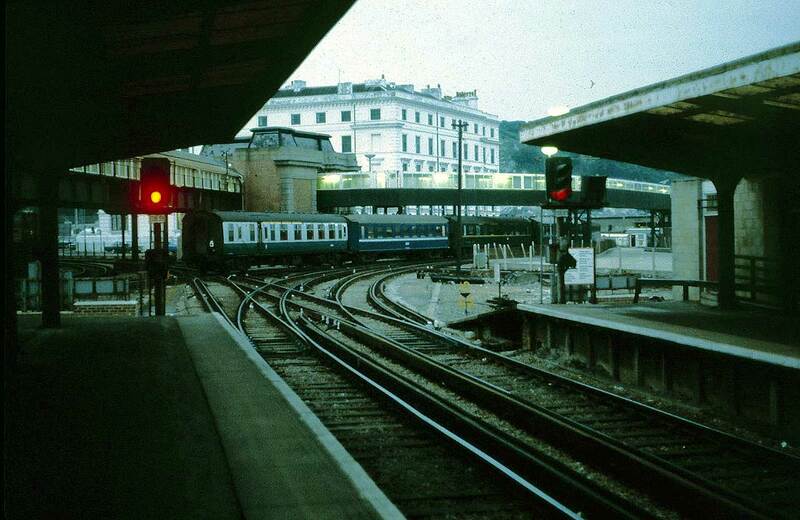 The regular arrival and departure point for the Night Ferry at London Victoria was Platform 2. 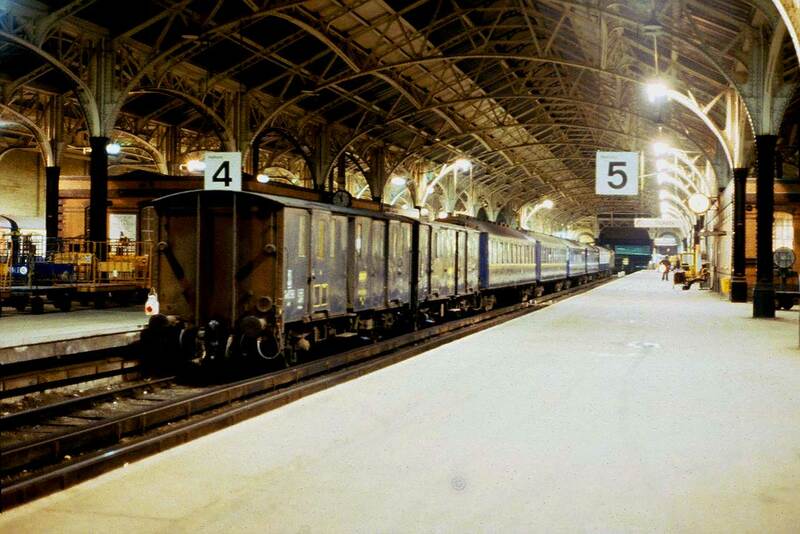 On a winter evening the empty stock is awaited. 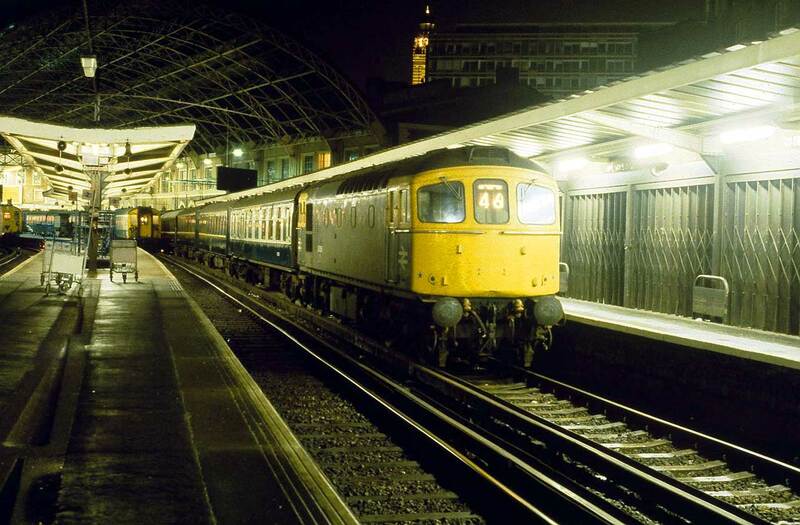 London Victoria and on this autumn evening the Night Ferry will be taken by a Class 33 diesel electric loco on its journey to Dover Western Docks. A close up view of the compartments of berths 1 & 2 and 3 & 4 of a Night Ferry Type F sleeping car. It may be seen in this illustration that Type F sleeping cars have passenger access doors at one end only. The door space at this end contains an attendant's office and opposite is a compartment for a boiler. The corridor side of a Type F sleeping car. No doubt one of the reasons for the demise of the Night Ferry was the alternative air services being advertised above inciting you to fly "Super Jets". 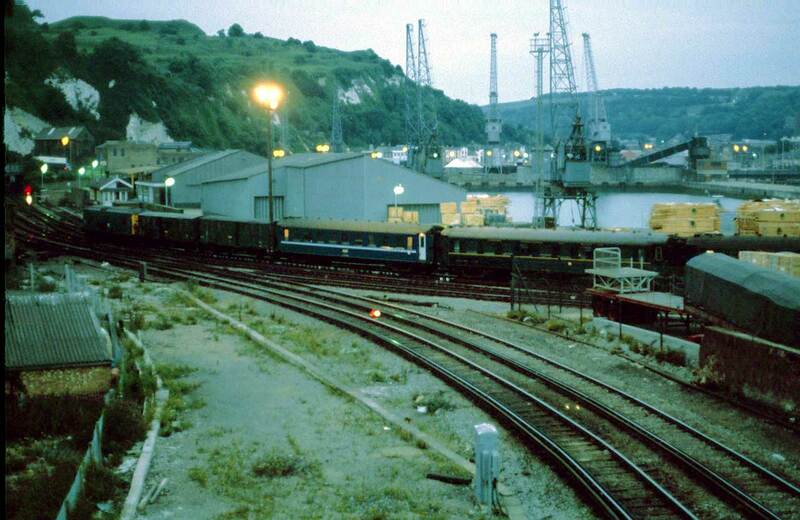 On this evening the Night Ferry arrives at Dover Western Docks behind a Class 33 diesel electric locomotive. The locomotive is uncoupled awaiting the arrival of the Class 09 shunter to take the train to the ferry. Usually there were two Fourgons at the London end of the consist. 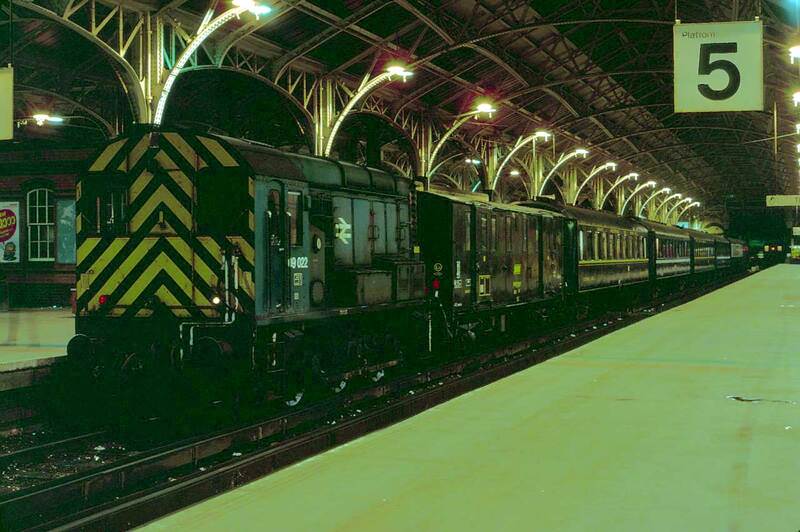 A view of the Night Ferry consist at Platform 4 in Dover Western Docks as a Class 09 diesel shunter starts to embark the train on to the ferry. The eastern approaches to Dover Western Docks in the early morning. 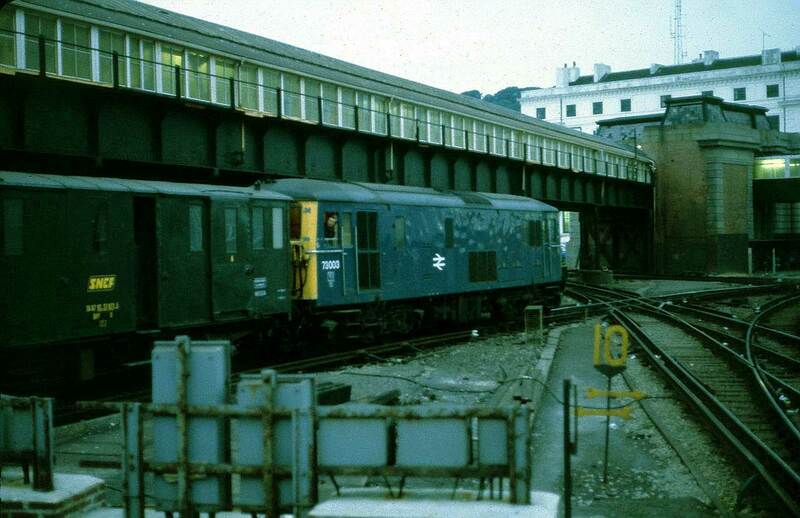 The sleeping cars and fourgons have just been disembarked from the ferry and the Class 73 takes the consist out onto the Dover Priory line at Hawkesbury Street Junction. 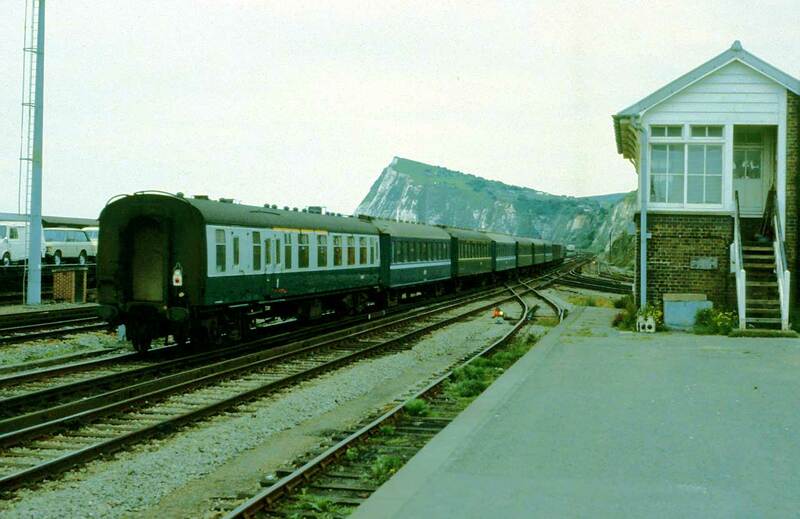 Once clear of Hawkesbury Street Junction, the consist is propelled into Platform 6 at Dover Western Docks Station. 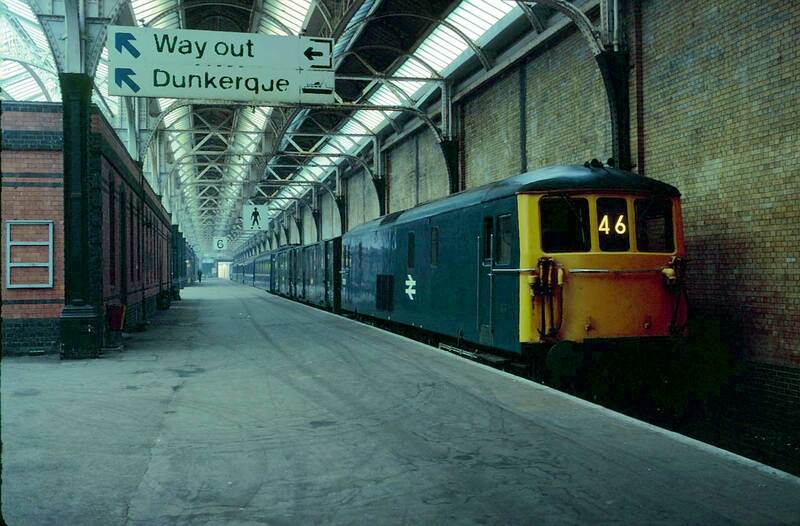 Finally arriving at Platform 6, Dover Western Docks. 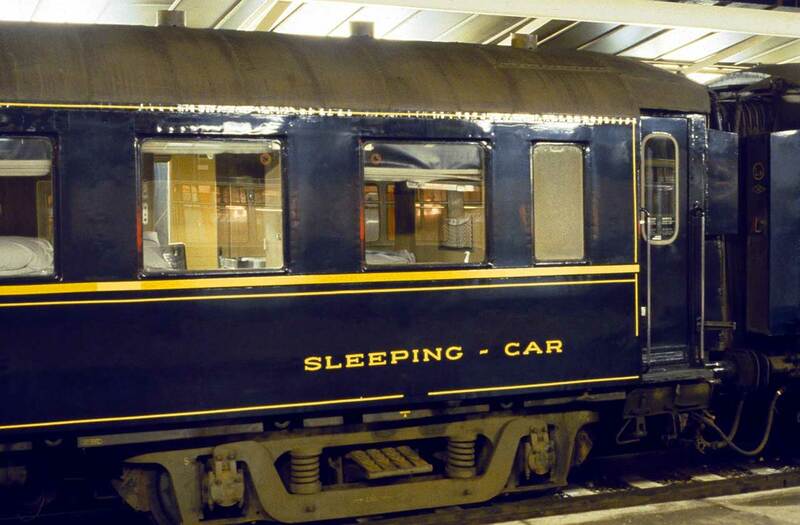 The sleeping car is one of three that was repainted in the lighter blue of the SNCF. A cautious approach was required when propelling the Night Ferry consist into Platform 6. The Night Ferry has just departed Dover Western Docks and is passing the site that was once the South Eastern Railway's Town Station. 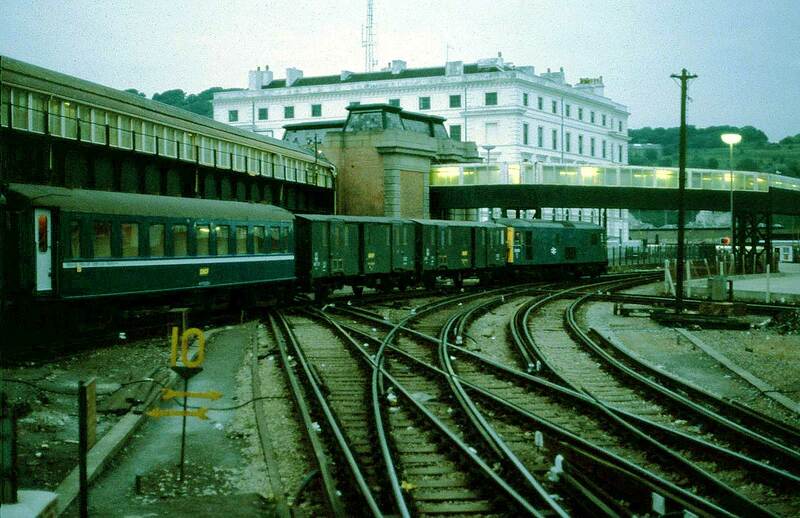 The London bound Night Ferry is now seen passing Archcliffe Junction where the line from Dover Priory Station joins. On this occasion the consist of the Night Ferry is a Class 73, two SNCF Fourgons, six Wagon Lits Type F Sleeping cars and a Mk. 1 Brake Composite. 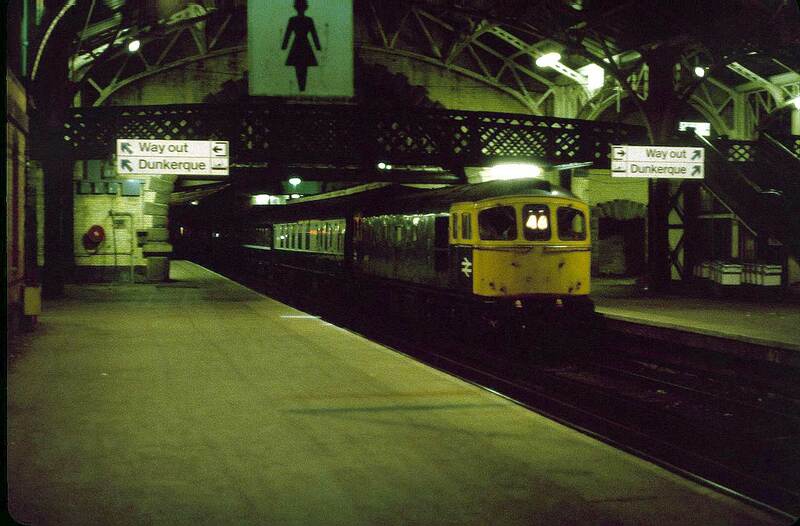 A view of the complete Night Ferry train on its early morning journey to London Victoria. This scene is taken from the footbridge adjacent to the eastern portal of Shakespeare Cliff Tunnel. 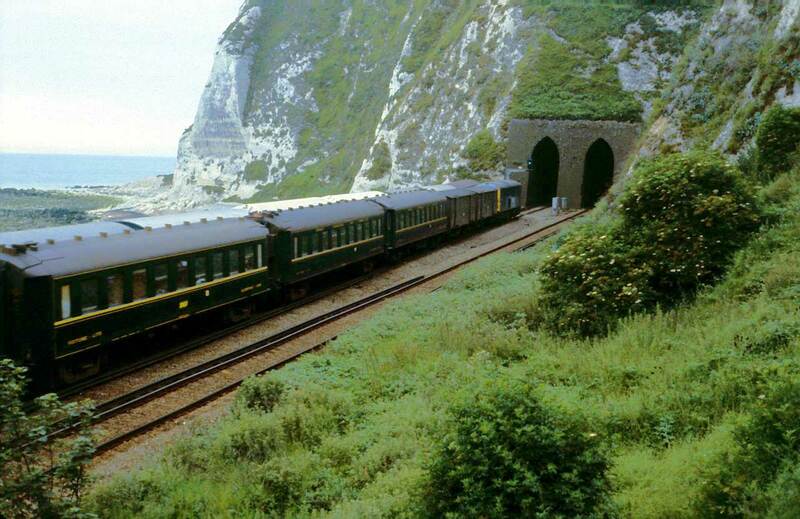 From the same location as above, the Night Ferry is just about to enter Shakespeare Cliff Tunnel, then Abbot's Cliff Tunnel and via Folkestone Warren, Folkestone Central, Ashford and to London Victoria. 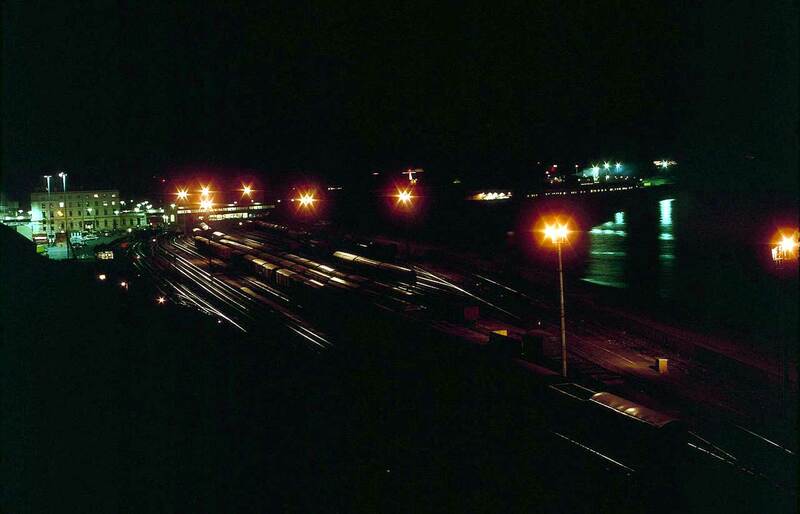 A nocturnal view of the sidings at Dover Western Docks. After the demise of the Night Ferry, the freight traffic increased especially after a new berth and link span was constructed on tidal waters. Three Type F sleeping cars were repainted in a lighter blue and carried the French railways logo, SNCF. 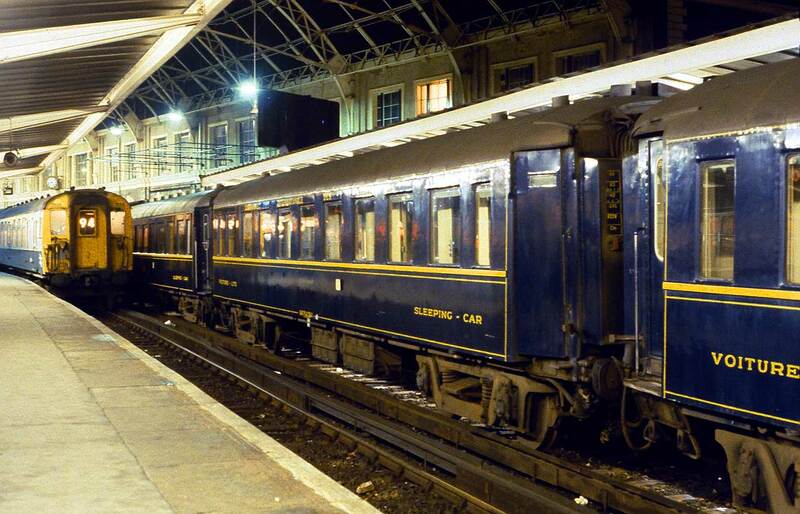 A view of a Night Ferry Type F sleeping car in the traditional colours of the CIWL just having arrived at Platform 4 at Dover Western Docks. Platform 6 at Dover Western Docks. 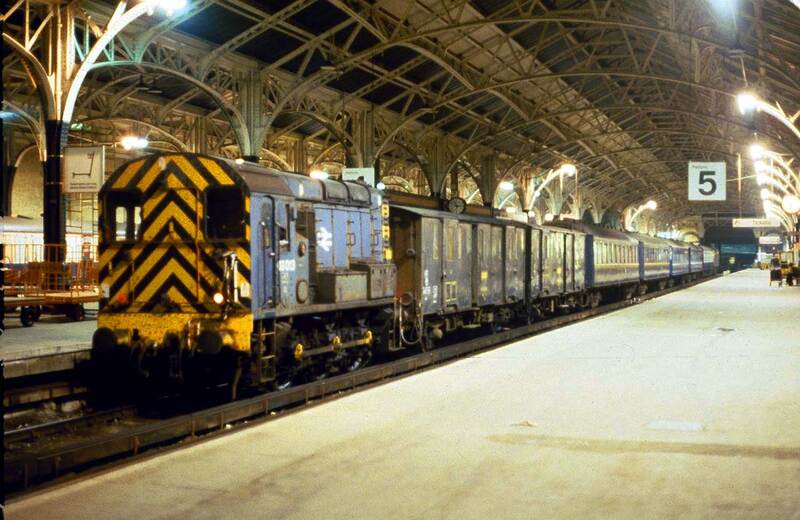 A Class 73 electro diesel is ready to take the Night Ferry to London Victoria. 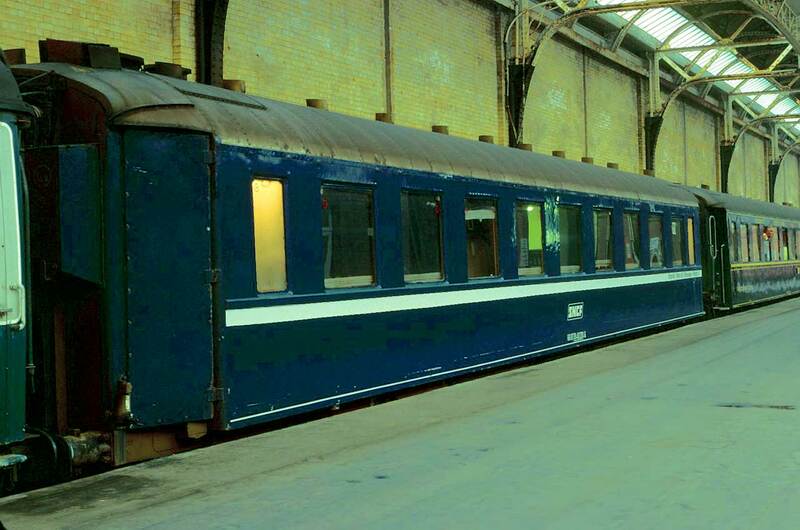 Two BR Standard MK.1 Brake Composite Corridor coaches were specifically allocated to the Night Ferry, numbers S21270 and S21273. 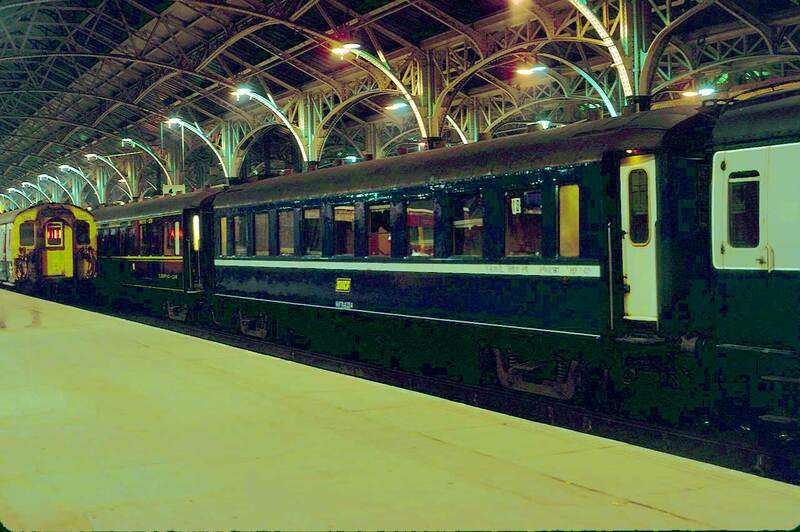 One of the three sleeping cars repainted with SNCF markings is ready to depart Platform 6 for London Victoria. The majority, the other twenty two cars, retained their traditional CIWL colours until the end. A better view of a Night Ferry fourgon. 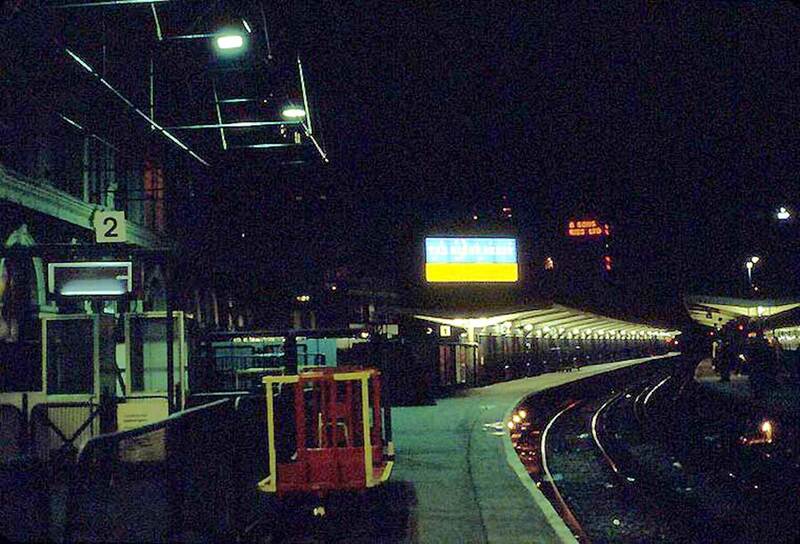 The London Victoria bound Night Ferry ready to depart. On another evening there is just one Fourgon on the rear of the Night Ferry. Once again a Class 09 shunter takes the train for embarkation onto the ship. 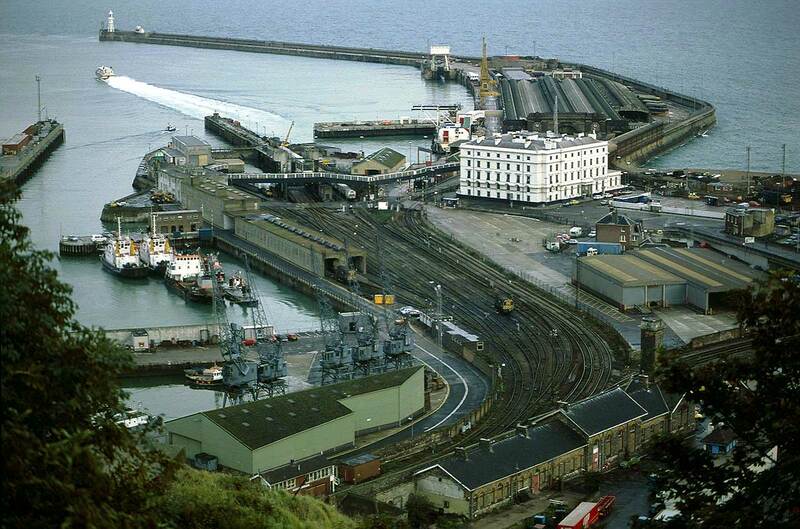 An overall view of Dover Western Docks showing the station and the train ferry dock and link span. No train ferry is berthed. The vessel departing is a Jetfoil on route to Oostende. 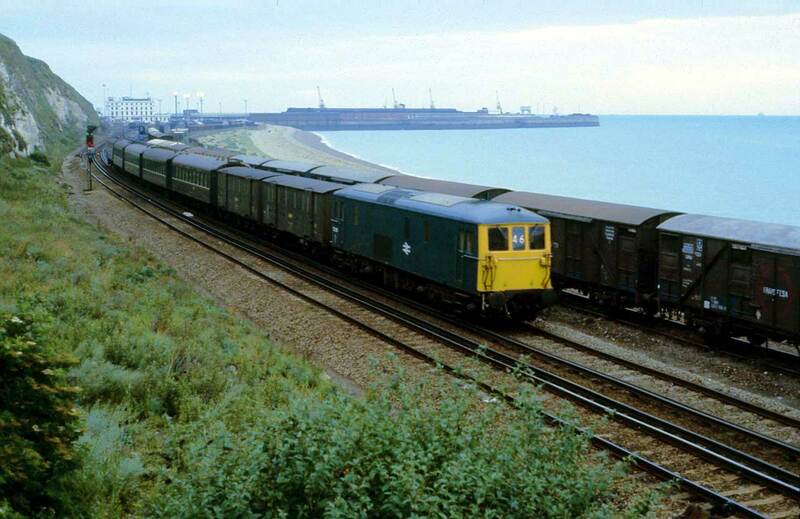 One of the train ferries used on the Dover to Dunquerke crossing was "Shepperton Ferry". 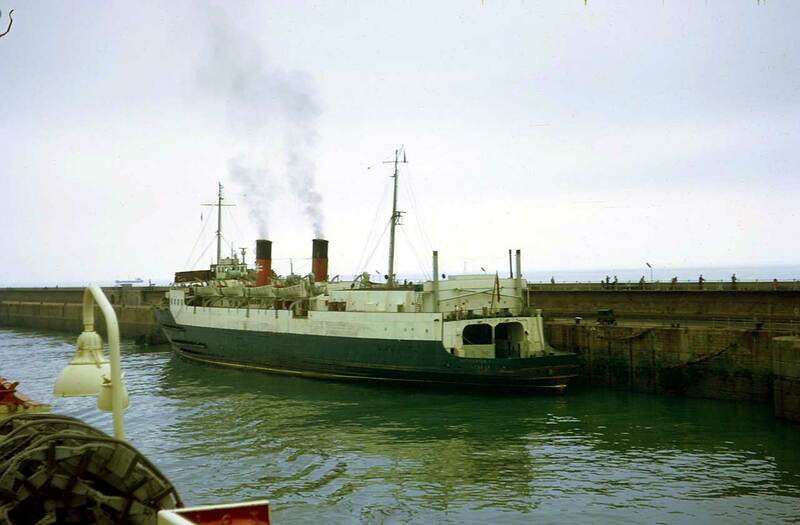 This ship entered service in 1935 and was withdrawn in 1972. 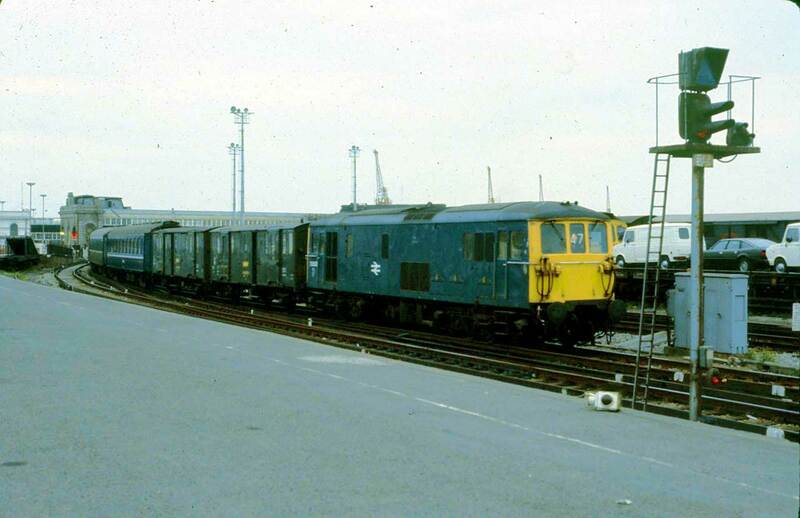 She is shown here at Dover Marine (Western Docks) in July 1969. 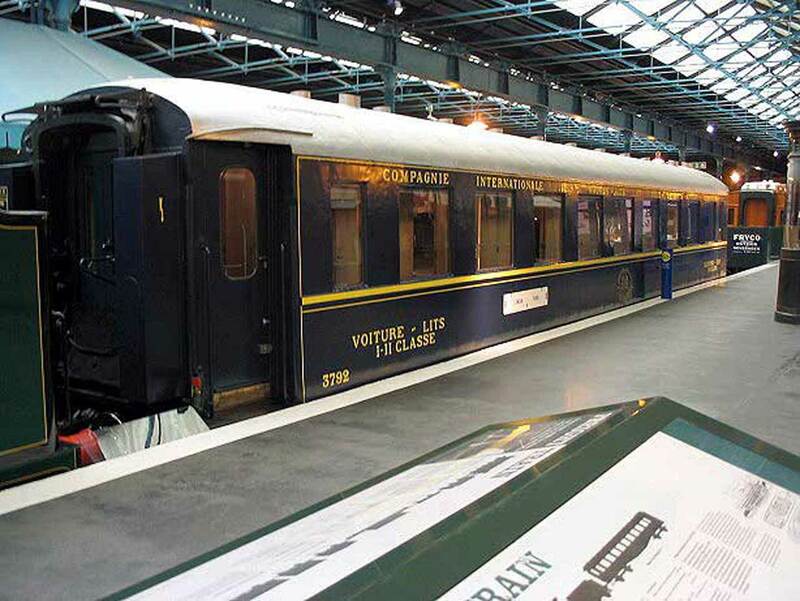 It is still possible to view one of the CIWL F Type Sleeping Cars by visiting the National Railway Museum at Shildon. 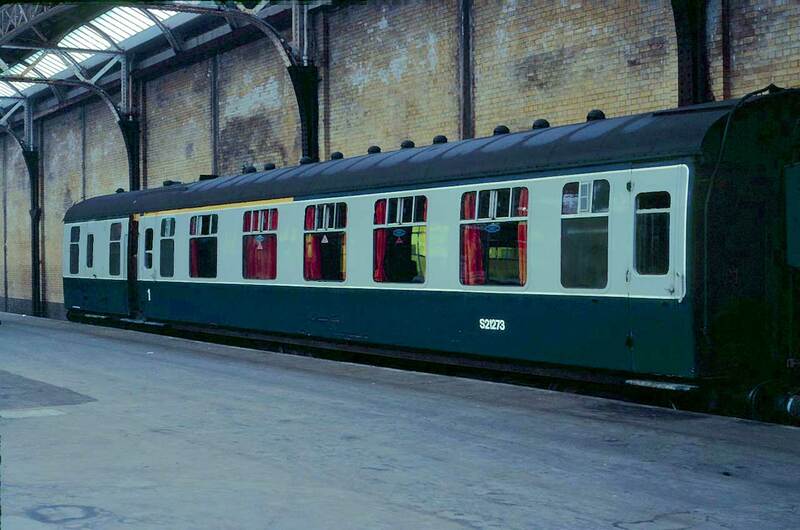 This photograph shows Car 3792 on display in its previous location at York. This brass plate may be seen on Car 3792 which was on display in the National Railway Museum, York. This Night Ferry sign is on display in the National Railway Museum. Representing the locomotives of the Night Ferry train in 00 scale is the easy bit as Lima made excellent models of both the Class 33 and Class 73. The Mk. I Brake Composite Corridor is available from Bachmann. 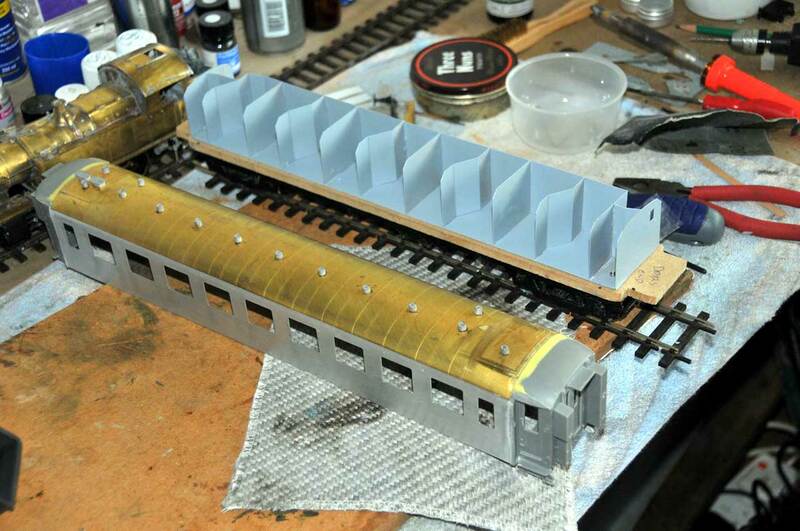 To model the Night Ferry consist accurately in 00 scale would require resorting to having to construct the sleeping cars and vans from kits or purchasing them in ready to run format. To enable completion of a representation of the "Night Ferry" train for use on Seabourne Marine in a reasonable time and at a sensible cost, compromises have had to be accepted. Sourcing ready to run sleeping cars and SNCF luggage vans requires a bit of searching on the used models market. 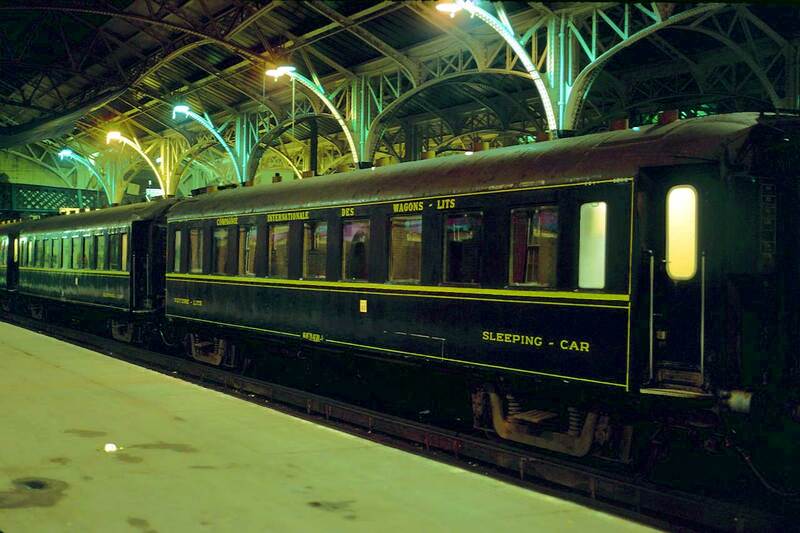 The CIWL type F sleeping cars were marketed by Playcraft in the UK and were made by Jouef. 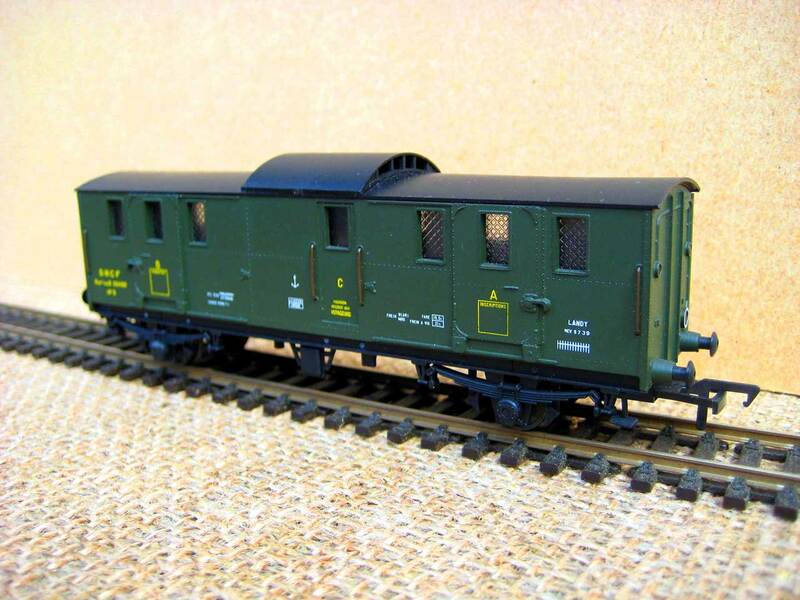 They are made to H0 scale but with a little modification the consist can be made to look acceptable. The Mk. 1 Brake Composite Corridor (BCK) is a model by Trix. The vans or fourgons illustrated on "Seabourne Marine" are modified Jouef vehicles. 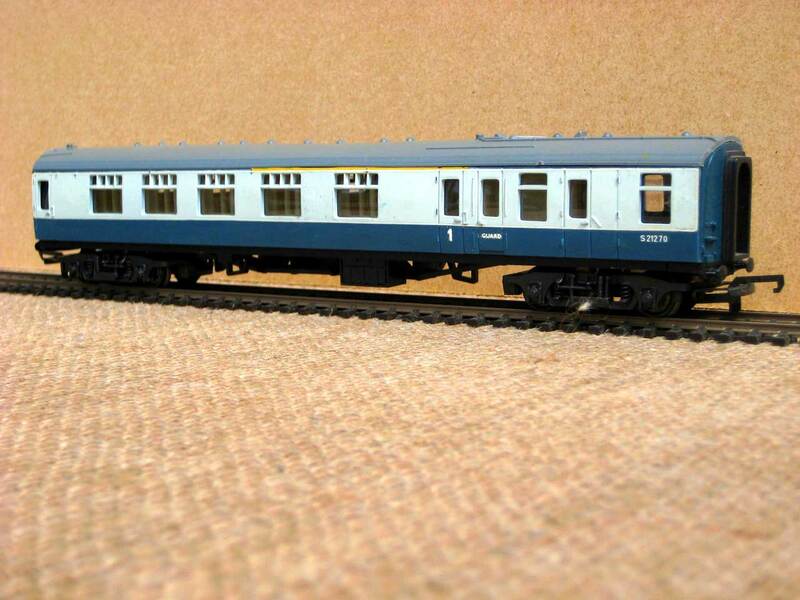 More accurate models of the Type F sleeping cars are produced by LS Models and ferry vans by MMM-RG and are illustrated below. 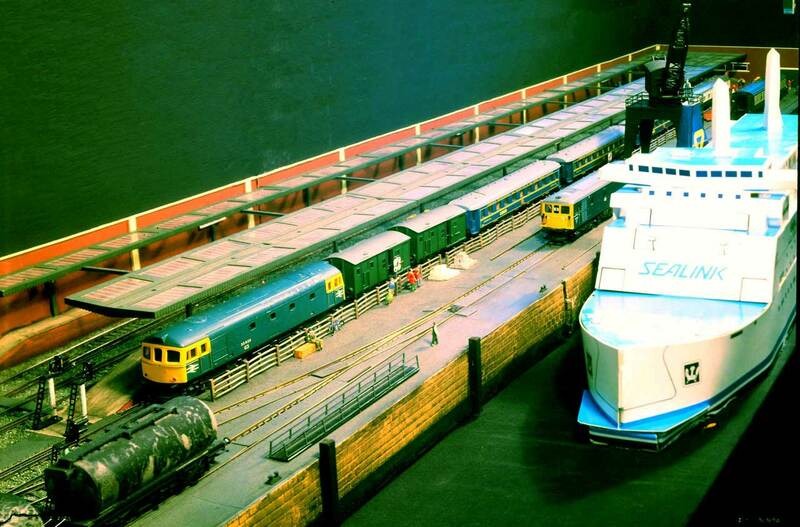 These first two illustrations of the model of the Night Ferry train are on "Seabourne Marine", a former Eastbank MRC exhibition layout. A view of the Night Ferry departing "Seabourne Marine" for London. The model of the BR standard Mk.1 Brake Composite Corridor coach is by Trix. 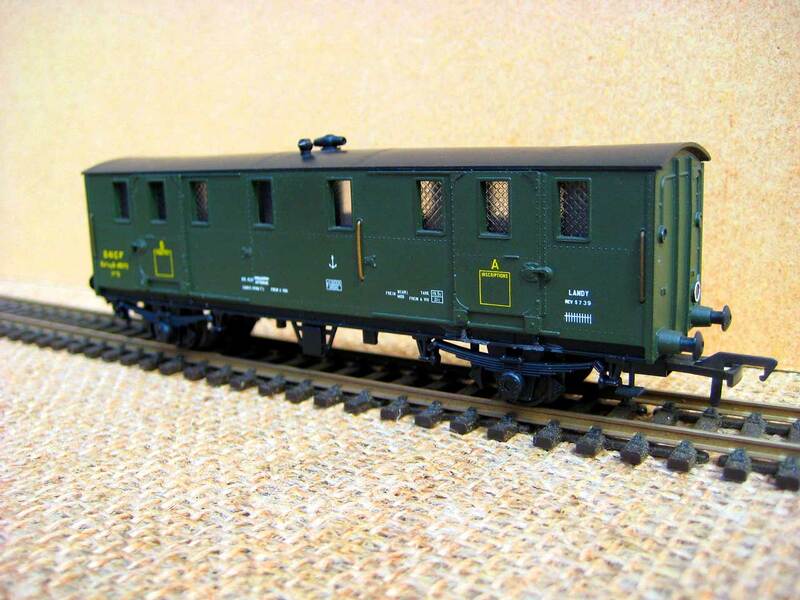 The H0 scale Playcraft Jouef model of the Type F sleeping car is really not a bad model considering it being manufactured in the 1960's and its extremely low selling price. Thirty three years after the demise of the real Night Ferry, LS Models have now produced excellent H0 scale models of the Type F sleeping Car. This is an example without the CIWL Monogram. 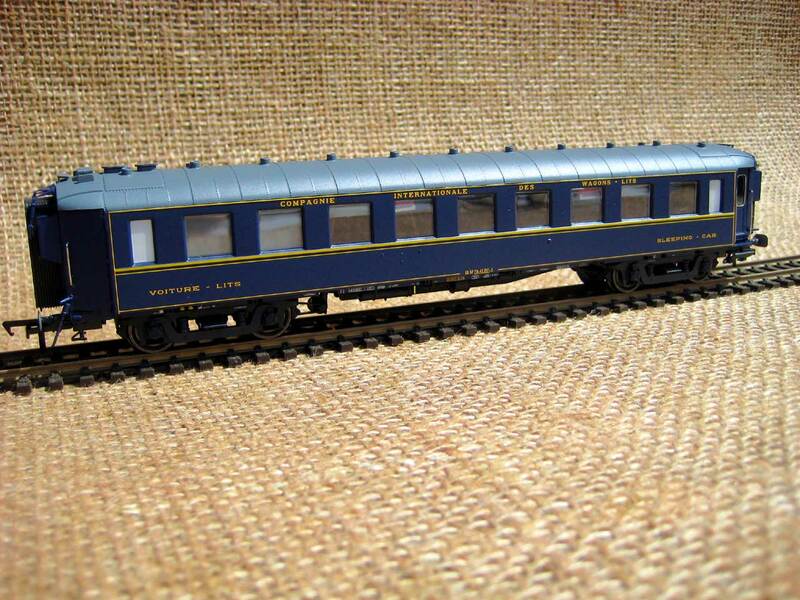 LS Models have produced a number of finishes depending on era for their H0 scale Type F sleeping cars. Three real Type F sleeping cars received a repaint in light blue with SNCF markings. More accurate models of the SNCF ferry vans are made in H0 scale by French company MMM-RG. 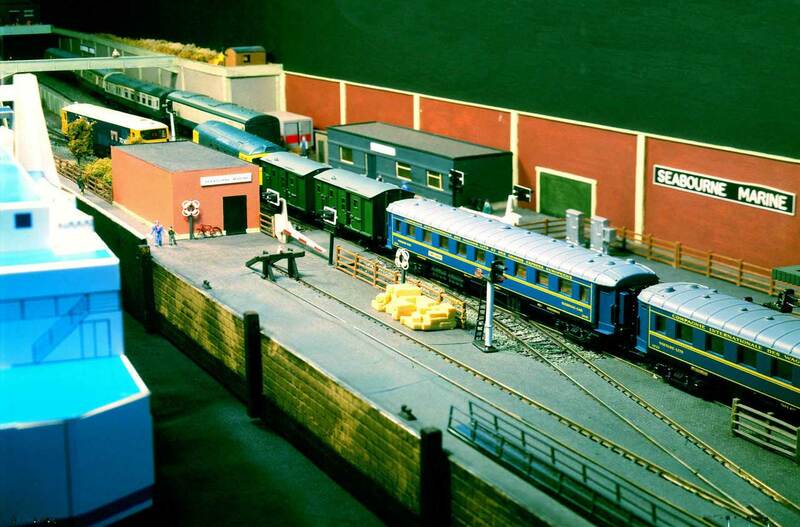 Two pre owned models have now been acquired since the layout photographs were taken. This image is of the version without accommodation for the guard. This model illustrates the H0 scale version of the Fourgon with accommodation for the guard and has the addition of a roof top look out. 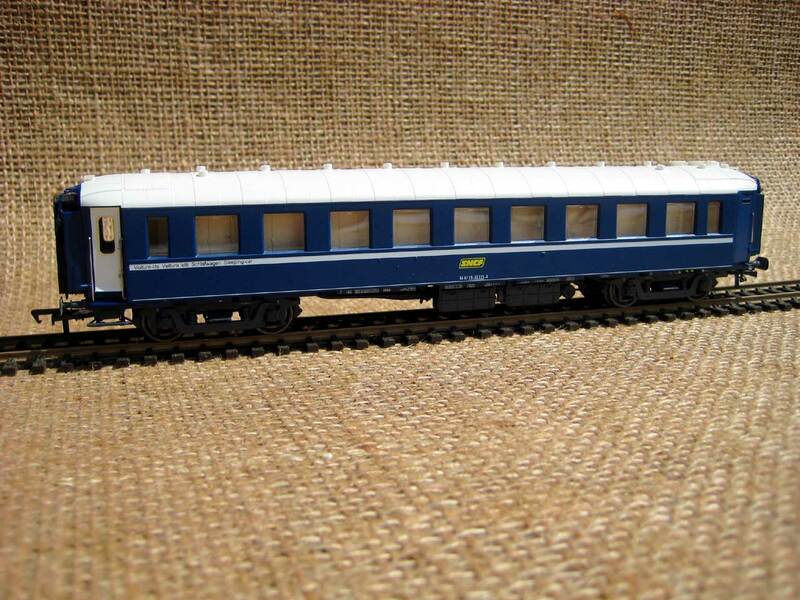 Kits for the Type F sleeping cars are also available in 7mm scale. Here a sleeping car is shown under construction. 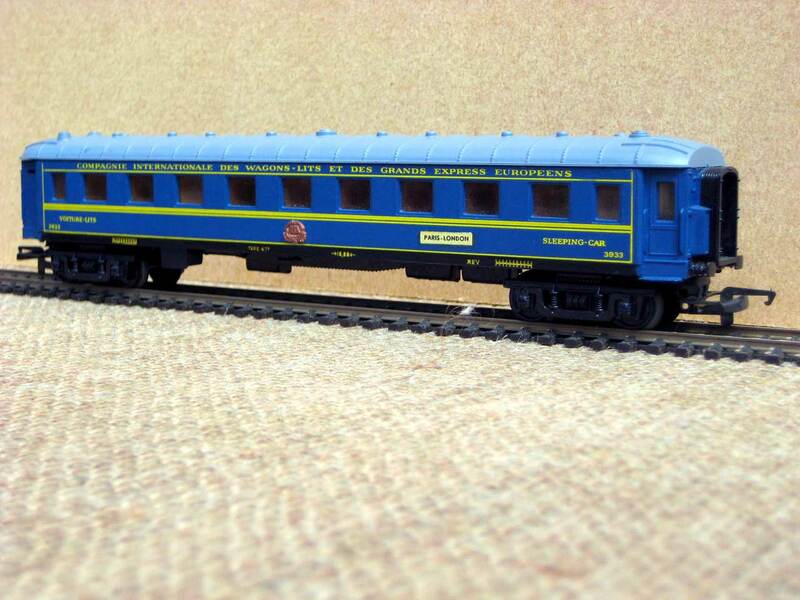 For more on 00 and H0 scale models of the Continental Sleeping cars, see the CIWL page.